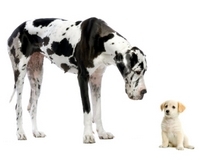 Adult dogs can vary in size from 2 pounds to 250 pounds1. So, with such a huge range of sizes, how can you figure out how much food your dog needs? OK… time to get a little technical. First, it’s important to know your dog’s energy requirements are not linearly proportional to his body weight. In other words… they’re not related to each other… in a straight line. A dog weighing fifty pounds does not necessarily use five times more energy than one weighing just ten. No… a dog’s energy requirements are not linearly related to his body weight. They’re related to his metabolic weight… the virtual weight of his energy-using tissues… his muscles, his organs, and so on. Of course… energy needs are also related to a dog’s activity level… how much he uses those tissues, too. Is your dog active… or inactive? Is he a puppy… an adult… or a senior? An internationally respected veterinary research institute has developed a formula that uses a dog’s metabolic weight to scientifically determine his energy needs2. Click here to use our Dog Food Calculator to reveal your dog’s daily energy requirements.